The Epoch Level 3 holster offers three levels of weapon retention for total security on duty, ensuring that your sidearm remains in its holster until you choose to draw it. The innovative retention system doesn't rely on snaps or hoods that can be accidentally opened. Instead, it locks into the pistol's ejection port, keeping it firmly in place automatically when you holster your weapon. The thumb-activated Pivot Guard allows a smooth, natural draw and is designed to prevent accidental closures. The Epoch comes with a Jacket Slot Duty Belt Loop, and is also compatible with the mid-ride and high-ride loops, sold separately. It also fits several popular models of Blackhawk under-barrel light, including the TLR-1, TLR-2 and X300. 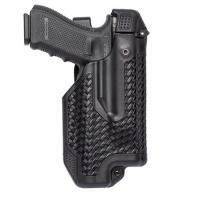 Immediately liked this holster from the word go Very smooth on the draw and it didn't take anything to adapt to the it. I've used the safariland holster for 10 plus years but Blackhawk made a far better product here. Great holster, my weapon and light fit well. Customer service and shipping time was good. I gave 4 stars because of the hood which covers the rear sights of my weapon. In order to re-secure the hood you have to also press on the button which releases the weapons as well. It seems a little unsafe and I wish Blackhawk would fix this problem. On the other hand the weapon seems to be secure without the hood down as well. Great product though, always have liked the company. Well built holster and easy to use. Easy to use, secure and durable so far. Very satisfied with this purchase. I used the Epoch with a Surefire. I had zero issues. I changed to a Streamlight and switched the insert. The holster went from great to a danger to my safety. The gun would not draw smoothly or quickly. The Streamlight is wider than the Surefire. The light drags on the side of the holster. The holster is not wide enough for a Steamlight. I have been using a Blackhawk CQC holster for the last 10 years. Now placing a light on my weapon this holster has the same draw and is quick with good retention, the good thing is that I will be able to use it on all my platforms thigh rig, duty belt, and paddle. Couldn't be any more happier A lIL more snug then I was expecting but all in all its awesome. Best holster I have ever owned, for Law Enforcement purposes weapon retention is on key. There is and will be only one mistake made with this holster, if the suspect does accomplish taking your duty weapon then the holster didn't mess up. You did. Gun fits a little more snug than with the other duty holsters I've used but after many draw strokes no scraping or scarring. I think it's the new retention design. It locks into the ejection port instead of the traditional retention lock being on the trigger guard. Kind of bulky but rock solid. Just what I wanted. Fast shipping. I will be using copsplus.com again. I have been waiting for Blackhawk to design a holster like this for a couple years and everything thus far has met my high expectations. Super fast to draw, quick to secure with the auto feature, and secures well on the duty belt. I would recommend the Epoch holster to any officer with confidence you will not be disappointed. Fits my M&P40 with TLR-1HL perfectly. Only issue is that I have to unlock handgun to put good back on. Once you get used to the functionality, great holster. Secures weapon properly. I love this thing. It's an easy draw especially if your used to the Safariland holsters. It is a little wider than most so it takes some getting used to so you don't run into things. It also sits a little lower than my old Safariland but it's not to bad. Gun is very secure even when just using the level 2. Cutting edge a must have for any law enforcement. I love it I was afraid that i would have to learn a new drawstroke using this one but it is almost exactly the same as my old Safariland. It does ride a little lower than my Safariland making it slightly uncomfortable in the squad but nothing I can't get used to. Okay, so first things first. If you want to have a mastergrip with every draw, as well as a consistent motion with or without the hood this is for you. also obviously, you need a light. I used the spacer marked TLR for my TLR-1 HL and it works perfect. A little wiggle room that doesn't bother me. with its level 3 retention, it's not going anywhere. do you get wear on your firearm? Yes, but that's not an issue for me. my partner is real upset about it and wants to go with a safariland now. But I think the functionality of this holster is unmatched. It does take a little getting used to on the draw because you have to compress the thumb drive enough to release the hood and the ejection port lock. Good thing is the ejection port lock wears down a little over time, giving me a nice smooth consistent draw. And I'm coming from a Blackhawk SERPA Level 3, and I think this is 100% a better system.